Aquaman turned quite a few heads with its box office performance despite a bang average storyline, and Jason Momoa’s star power is now being used to improve cookie sales. He may have ripped out tongues as Khal Drogo in Game of Thrones, but fans on both sides of the pond probably wouldn’t mind him knocking on their door with arms full of sweet treats. Despite a smile that could sell water to fish Jason is a busy man and probably doesn’t have time to physically go door-to-door selling girl scout cookies. However, the Girl Scouts of Colorado have managed to pull off the next best thing, making the Aquaman front and centre of their cookie marketing strategy. Charlotte Holmberg is a Girl Scout from Highlands Ranch in Colorado, and is something of a pint-sized entrepreneur. As reported by Today, Charlotte is the Top Cookie CEO of her troop, having earned a reputation for selling a phenomenal amount of cookies. Charlotte sold over 2,000 boxes of cookies in 2018, and wasn’t about to let her hard won status slide. And so this year, she went all out; considering her target market with all the ‘thinking outside the box’ inventiveness of a high powered advertising executive. Charlotte and her mum – who works in marketing – cooked up the idea one evening after Charlotte’s mum noticed a meme floating around comparing the words ‘Samoa’ and ‘Momoa’. Now, for those who are a little rusty on their Girl Scout culture, Samoas are a orangey colored cookie – or biscuit to us Brits – filled with caramel and coated with toasted coconut. Delicious indeed, but even more so with Jason’s handsome face on the box. Yup. 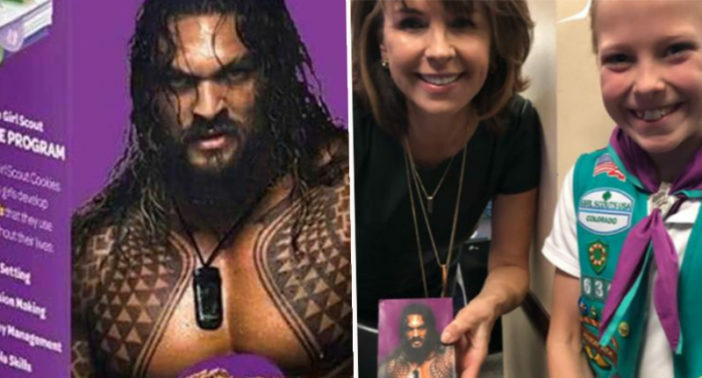 Charlotte and her mum went about recreating the iconic purple packaging of Girl Scout Samoas to include an image of a shirtless Jason Momoa, complete with a smoldering glare. The moms are getting really excited and they’re saying that they need them! The girls will wanna buy some because he’s on the front. And the boys will also wanna buy some because he’s like, he might be like they’re favorite character. ‪Thank you Kim Christiansen and Kristen Aguirre of 9NEWS (KUSA) for supporting Girl Scout Charlotte and purchasing a package of Jason Momoa Samoas! Unsurprisingly, the treat has proved to be a roaring success, with many happy customers taking to social media to express their approval. I don’t even like Samoa cookies, but I would legit buy a box of Momoa Samoas. I’m suddenly in the mood for a LOT of Thin Mints. Could Charlotte Holmberg be the 21st century answer to Don Draper?